Carbonara means Charcoal Burner in Italian – I looked it up. Surprised? Me too. Because for the longest time, I thought it meant “bacon,” because it’s nearly impossible to find a recipe for Carbonara that doesn’t include bacon, or its fancy cousin, pancetta. Which is too bad, because Sun-dried Tomato Carbonara is delicious – with or without bacon – and super-duper easy to throw together. AND it can be ready in as little as 10 minutes. YES!! You read that right – 10 minutes, pot-to-plate! So you could actually have a decent meal on Soccer Practice nights. Really! Delicious – even without Bacon!! 6 oz. angel hair pasta you can use fettuccine or spaghetti, but angel hair is our favorite, plus it cooks in no time! Optional: bacon bits either real or vegetarian for those who want to sprinkle them on top. While the pasta is cooking, chop the sun-dried tomatoes into small pieces. Whisk eggs, milk or cream, half of the Parmesan and seasonings in a small bowl. This last part happens very quickly, so Be Prepared!! When the pasta is done, drain it thoroughly and immediately put it back into the pan over very low heat. Drizzle the egg mixture quickly into the hot pasta, tossing it all constantly with tongs as you do. You want the eggs to set, but not curdle or get all chunky. (It’s OK if this happens though – it still tastes just fine.) Throw in the chopped sun-dried tomatoes, most of the basil and the remaining Parmesan and continue tossing until the mixture thickens and the eggs have set. Garnish with additional freshly ground pepper and fresh basil. This is not a fancy-smancy Pasta Carbonara recipe – it is a fast, easy family-friendly weeknight go-to. Enjoy! I used spaghetti for years too, Bill. But my kids converted me, and now I almost always use whole wheat angel hair pasta. It takes about 6 minutes to boil, and the whole wheat gives it some body so it doesn’t get “lost” in the mix. I do understand about old habits though! Yum! What a great idea! 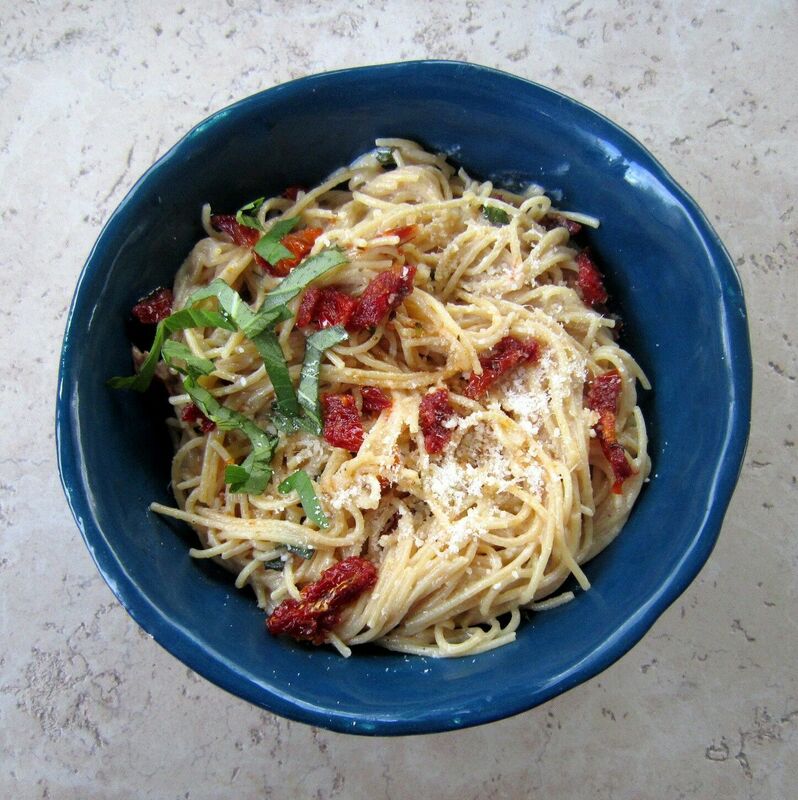 I love carbonara AND sun dried tomatoes and this is a great alternative to our current recipe. I love simple pastas like this…and I adore sundried tomatoes! Found you through SITS! nice to meet you! I am all about easy!! Pinned this – love sun dried tomatoes! 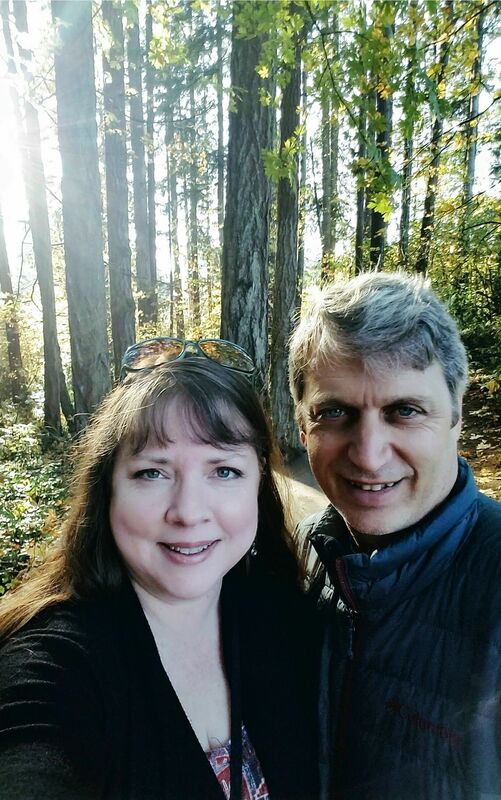 Visiting from SITS…hope you enjoy your day!